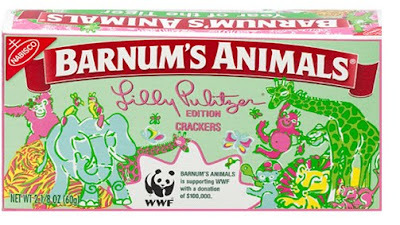 Maryland Pink and Green: Giveaway and a winner, too! Remember how difficult it was to find the special edition Lilly Pulitzer animal crackers? Maybe you found them, but do you have any now? Here's your chance to win a box of these hard to find cookies. In fact, the Pink Pelican is sponsoring a giveaway for 3 boxes of cookies, so I'll choose 3 winners! 2)by subscribing to our RSS feed on The Pink Pelican Blog. 3) by "liking" The Pink Pelican on Facebook. 4) by following us on Twitter. Be sure to let me know how many entries to give to you! To make this a quick and fun giveaway, please submit your entry before midnight on Wednesday, June 30. I'll announce the winner on July 1! You can shop at the Pink Pelican here. They are offering a special deal with the Ashley dress in Hen House. Buy the dress, get a pair of Spaghetti Strap McKims for free! The Preppy Outlet, the Pink Pelican's outlet store, also has most of spring on sale for 50% off. A huge thank you to everyone who participated in Follow Friday! I'm constantly amazed at how wonderful our blogging community is and am delighted to find new blogs each week. Although we didn't make it to 50 links, we were close and I'm hopeful that next week there will be more than 50 bloggers on the list. Congratulations to mrs. mfc who is the lucky winner of an A. Tierney makeup bag! Thanks for sharing your blog. Please contact me within 2 days with your mailing address. Enjoy your Sunday! Today Melanie from the Pink Washingtoniette and I are co-hosting a Cupcakes and Wine party. It will be so exciting to meet some of my "blends." Oh, I'd love to enter! I'm subscribed to the Pink Pelican, so that would be 2 entries. Hope you have a fun Sunday! This is my one entry :) Thanks!! I am one who has never been able to find these. You are so sweet! I am a subscriber as well as a fan on facebook! 3 entries for me! I am a subscriber and like on facebook. I'm so hoping to win these as I haven't been able to find them in stores! I would love to enter! Thanks!